The DACA approvals keep coming! As of October 10, 2012, USCIS reports that almost 180,000 applications for Deferred Action have been filed. About 160,000 of those have been scheduled for their biometrics appointment. About 6500 have been reviewed and of those, about 4500 have been approved. That leaves about 2000 either denied or incomplete — that is, USCIS probably issued a Request for Evidence because of incomplete or insufficient evidence. Here at ILG, we’ve been doing our part. We hosted workshops, participated in different community clinics, and offer a one-step, same-day processing program for eligible immigrant youth. More than 300 youth have been served since we launched our DACA Campaign for Immigrant Youth. An RFE – a Request for Evidence — is an important notice that USCIS mails to applicants whenever an application is incomplete. Generally, an applicant has a limited amount of time to apply (up to 87 days). Failure to respond to the RFE will result in the denial of the application. A partial response will also likely result in a denial. If a DACA applicant receives an RFE, you must take action. Do not ignore the RFE! It will cause your application to be denied and you may be ineligible for DACA benefits. All applicants for Deferred Action status must attend a biometrics appointment. What is a biometric appointment? In Oregon, a biometric appointment takes place at the USCIS office in downtown Portland. On the first floor of the USCIS office is a special room called the Application Support Center. Inside, there are special technicians that operate a series of computers that will scan each applicants fingerprint prints and take a photograph using a camera that is like something you might use for a webcam. In addition to the fingerprint scan and photo, each applicant must complete a short physical description form (your height, weight, eye color and such). All this information is input into the computers that then conduct searches for police records and immigration records. It is a very thorough search process. Don’t forget to bring your biometric appointment notice and your photo ID (for DACA, school IDs are acceptable if you don’t have an Oregon ID). Multiple Entries. To qualify for Deferred Action, an applicant does not need to prove uninterrupted physical presence for five years—only continuous residence. That is, even if you have made multiple entries to the US, you might still qualify for DACA. No one is required to prove that she resided in the United States for every day or even every month of that period. Short trips outside the US made before June 15, 2012 will not disqualify an applicant if the trip was brief, casual and innocent. 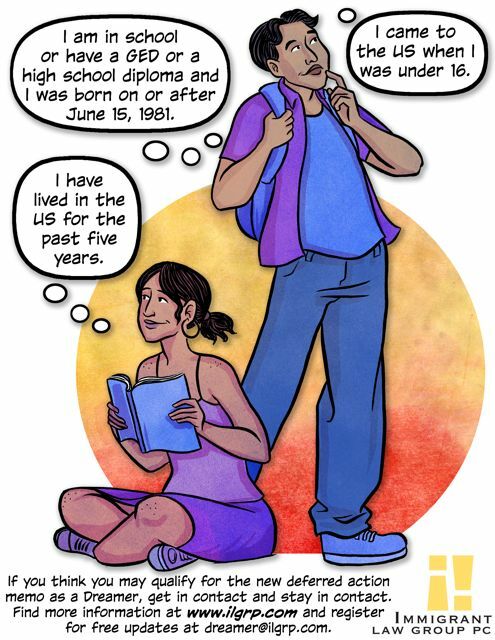 What about youth who came to the United States before turning 16, subsequently departed, returned to the US after reaching age 16 but prior to June 15, 2007? If you satisfy all the other requirements of DACA, you technically qualify. At a recent stakeholders’ meeting, however, USCIS indicated that DACA was not intended to benefit individuals who were out of the United States for more than a year prior to June 15, 2007 and were older than 16 at the time of their last entry before that date. USCIS has indicated that it will issue additional guidance on this issue. That’s a bummer. And it clearly isn’t in keeping with the spirit of President Obama’s intent. Youth who find themselves in this type of situation should check in with an attorney. International Travel. Applicants who travel outside the United States after August 15, 2012 will not be considered for DACA unless you have government permission. If your DACA application is approved, you may be permitted to travel abroad. Permission to travel internationally is called advance parole. You can only get advance parole from USCIS. After receiving deferred action, individuals seeking to travel outside the United States must apply for advance parole and pay the $360 filing fee. The rules say that if you’ve got DACA approved status, then international travel may be permitted if the intended travel is humanitarian, educational or employment-related. The advance parole must have been granted prior to any departure. International travel with advance parole can be dangerous. Individuals who have reached the age of eighteen may be subject to the inadmissibility bars, you might trigger a deportation order, and there could be other serious consequences. Best to check in with a good lawyer before making any trips outside the US.